As a business owner, you know just how important it is to maintain a good appearance. Everything from your uniforms to your signage to your building has to present the right look to people. Making a good first impression is especially important in a world of increasing competition, so you have to make sure that every part of your business looks the best. It can be easy to overlook some things that you see everyday, like a sun-faded sign or cracking and sinking concrete. When it comes to your concrete, you should be especially concerned. Not only does damaged concrete not look good, it can also lead to an injury, which you probably don’t want to pay for. 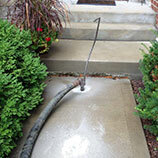 At B & B Concrete Lifting here in Chicago, we make it easy and affordable to repair the concrete around your business. 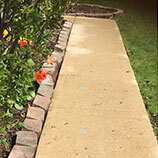 In this entry, we’ll cover the basics of how concrete starts to sink and crack, as well as how our concrete repair process works and why it is so much better than having to repour all of your concrete slabs. 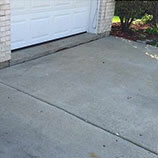 Read on or call us today find out how we can make your concrete look almost brand new again. 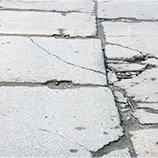 Unless your concrete has been driven over by vehicles that are extremely heavy or a bunch of heavy objects were dropped onto the concrete, the most common reason that concrete cracks and sinks is because of erosion. But this kind of erosion isn’t visible, it takes place underneath your slabs and can be caused by heavy precipitation, improper drainage, or poor work on behalf of the company who originally poured the slabs and didn’t level the ground correctly. Over time, soil can also compact and force the slabs to sink unevenly which leads to cracking. Compaction and erosion are both problems that can become potentially dangerous if not dealt with. In addition to the possible dangers they pose, broken and cracked concrete can turn potential clients away. In order to stop the problem from getting worse, call us at B & B Concrete Repair now. Our special process is affordable, quick, and takes care of the problem in a way that other methods just can’t. 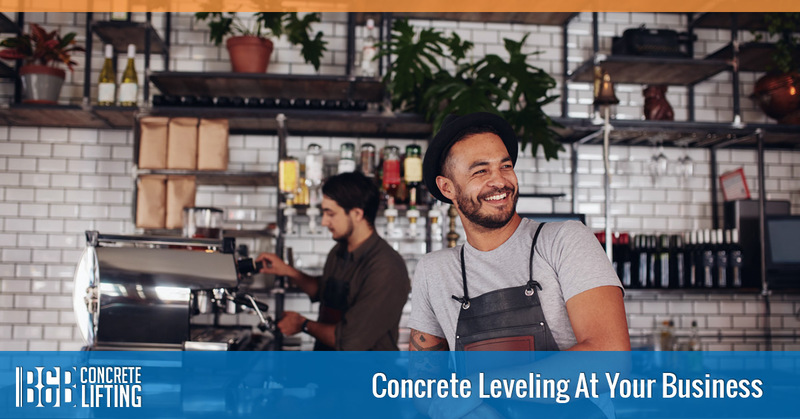 When you call us, we’ll set up a consultation where we’ll come to your business and evaluate the concrete and give you an estimate. As long as the damage isn’t horrible, we can probably fix it, and we’ll be able to fix it for far less than than the cost of new concrete. After drilling a small hole in your slab, we pump a special material underneath your concrete that lifts it back to its original position and keeps it there. The material we use is safe but also resists compaction and further erosion. The entire process takes less than a few hours and doesn’t require a giant crew of workers. We work fast, we work efficiently, and we work clean. Contact us today to find out how we can help your business make the best possible first impression while also keeping yourself, your employees, and your customers safe.